If you think going organic is just a fad, I'm here to tell you it's officially a trend. In 2016, Americans spent more than $43 billion on organic food. So it's no wonder more grocery stores are specializing in "cleaner foods" are popping up all over South Florida. Today, I went shopping at the brand new Earth Fare in Palm Beach Gardens and I and 500 friends got he first look at the new store located in the Midtown shopping plaza. It was a spectacle at 7 a.m. as people everywhere were flocking to the free samples. "It reminded me of Trader Joe's but on steroids because it's so much bigger," says retired RN Carol Winig of Jupiter. With 55% of Americans believing organic foods are healthier than conventionally grown food there is high demand. We now have four similar stores in a 3 mile stretch of PGA Boulevard including; Earth Fare, Publix Greenwise , Trader Joe's and Whole Foods Market . But how do they compare in prices on basic items? We went to all four stores to do price comparisons on four items. Organic Bananas. Publix Greenwise is twenty cents more expensive than Earth Fare and Whole Food Market. 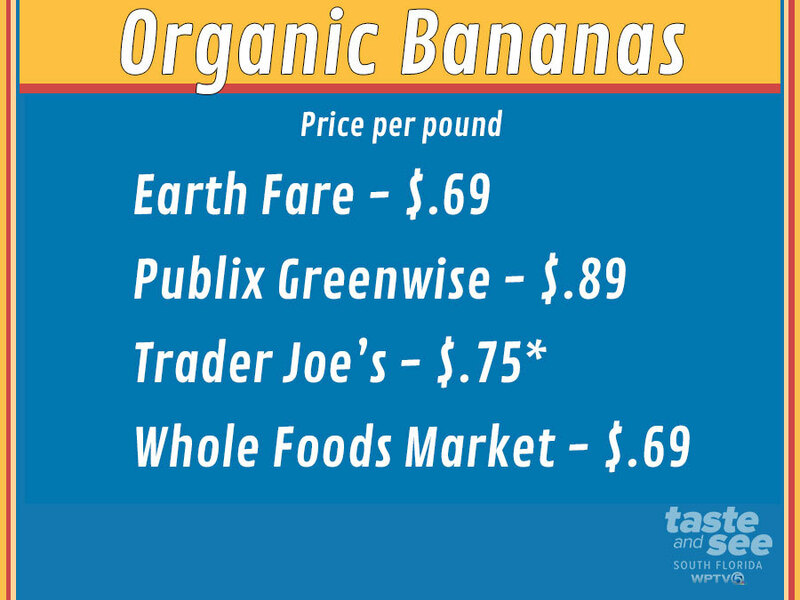 * Trader Joe's sells by the banana, not the pound. This price was figured by assuming three bananas equals one pound. 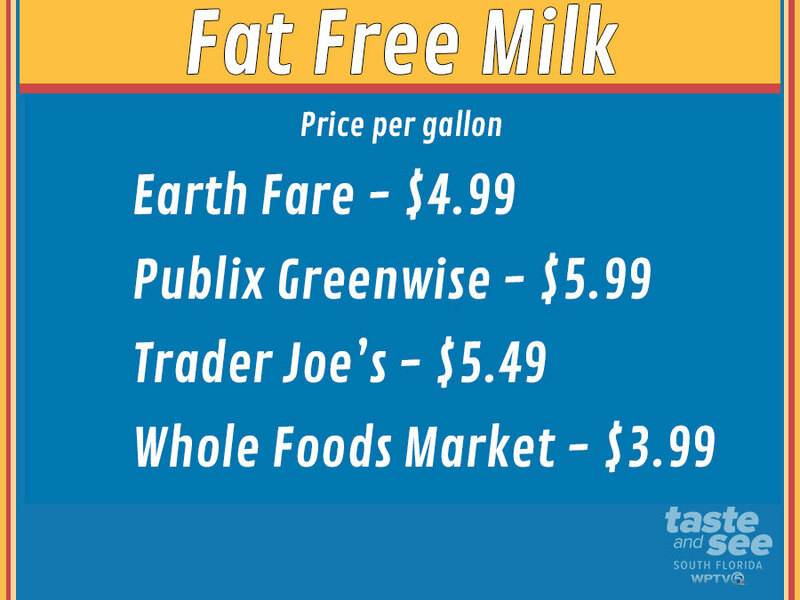 A gallon of skim free milk is $5.99 at Publix Greenwise, two dollars more than the price at Whole Foods. 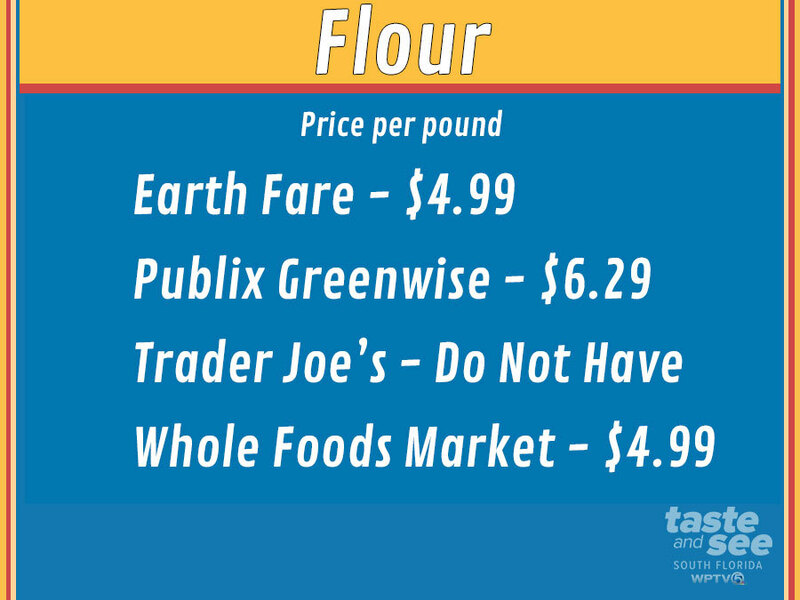 Organic all-purpose flour is $1.30 more expensive at Publix Greenwise than at the other stores. 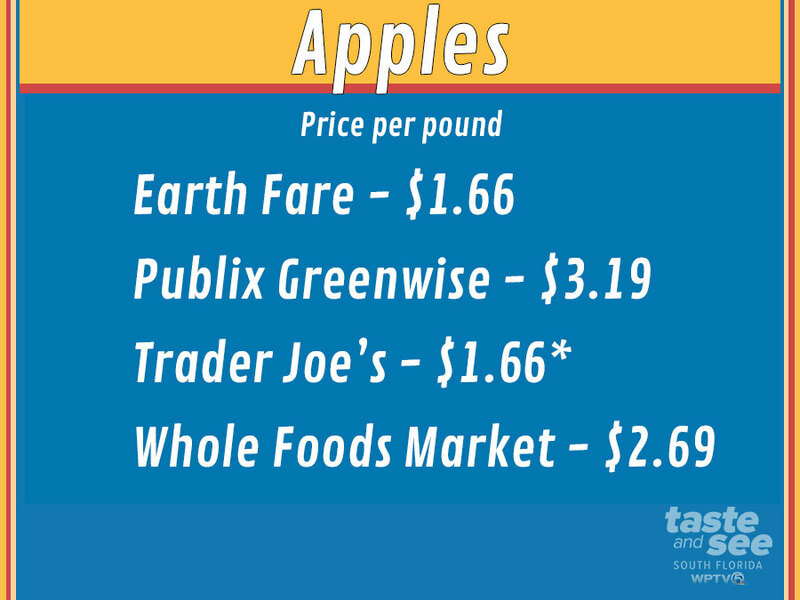 And organic granny smith apples are cheapest at Earth Fare and Trader Joes; they are a $1.53 more expensive at Publix Greenwise. * Trader Joe's sells by the apple, not the pound. This price was figured by assuming four small apples equals a pound. Earth Fare says comparing prices is like comparing apples to oranges because they offer something different. "So when you come into an Earth Fare, every single product will be free of artificial colors, flavors, and preservatives," says Earth Fare Spokesperson Laurie Aker. Additionally, there are no foods with added hormones or antibiotics, no added trans fats, no high fructose corn syrup, no bleach or bromated flour, no artificial flavors, colors or preservatives, and no GMOs. "We like to say we read the labels so you don't have to," touts Laurie. What did Nurse Carol like? "There vegetables were absolutely gorgeous," says Carol. And what would she change? "I shop at a place that has Kosher beef." The store is a sight to see. It has hot ready food, a juice bar, and none of the fruit had a blemish on them. We’ll see what consistent competition does to the prices.